This will certainly make you popular around the office! I was never one for apple pie. No offense to the apple; I just like tastes a little less traditional. In high school, when I first started making this recipe from a handwritten scrawl taken from the internet, pears were a fitting upgrade. Now, I’ve adapted the old recipe with a little fresh thyme – a subtle move that adds some complexity and excitement to the taste. I made this tart for my company’s holiday bake-off yesterday, but I’m starting to learn that the win always goes to dishes which are familiar. In my three years of entering, the top ranking dishes have included tres leches cake, red velvet cupcakes, cookie dough pops, and oreo cookie truffles. Passive aggressive rumblings about the competition’s rules and judging aside – but seriously, all bake-offs should disqualify non-baked contributions – do most Americans have a bias toward dishes they’ve tried before? One thought is that recognizable dishes align with a taste memory. Though, I’m not sure if that would tip the scale towards a higher or lower score. While a positive taste memory could elicit warm feelings of nostalgia, failure to live up to that expectation could be damaging. A negative taste memory could also be a difficult hurdle to overcome. What do you think? Do you tend to prefer dishes that you know you have liked in the past? Or, does a creative approach help to even the playing field? This is a delicious tart that’s perfect through fall and winter as pears survive without ripening in cold storage. Since you only need your fingers and a rolling pin – which could be replaced by a wine or soda bottle – it’s easy to make in an ill-equipped kitchen. My team got to try after the judges had their turn and each gave their thumbs up all around. So our contest had points for taste, presentation, and a third category for each judge to assign points at whim. What kind of judging is that?? A third of the points for an inconsistent standard. In a medium bowl, stir together flour, sugar and salt. Cut butter into small, 1/4″ cubes. Mix and press flour and butter between your fingers to develop a course crumb. Pour in ice water and stir with your fingers until it just holds together to form a ball. Wrap in plastic and refrigerate for at least an hour. Preheat oven to 350 degrees. If hard, allow dough to warm until just pliable. Roll out on a floured surface and turn into a 10″ tart pan (or a deep pie plate), using the rolling pin to cut along the edges. Pierce with a fork, brush with beaten egg and bake for 15 minutes. Remove from oven and allow to cool completely. Peel pears, remove core and slice very thinly. Mix with sugar and flour. 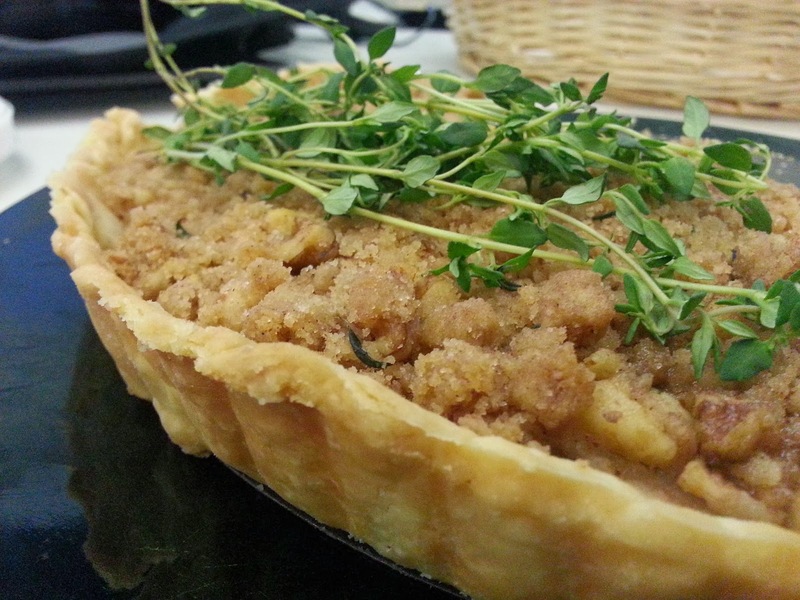 Spread evenly in cool tart crust. Mix together all ingredients with a fork until a course crumble forms. Spread evenly over pears in crust. Bake for 40-50 minutes at 350 degrees until the pears are tender and the streusel is golden and crisp. Pairing with wine? My friends at Qwiker Liquor recommend late harvest whites from Semillion, Riesling, and Gewurtztraminer grapes to complement the pears.